Facing the shore and walls of the Old City of Acre, amidst the narrow alleyways is the Efendi Hotel, a boutique hotel built by Uri Jeremias, the man and the name behind the famous Uri Buri fish restaurant in Acre, an institution in the northern coastal city. The small and splendorous hotel was constructed out of two ancient buildings, restored and linked together. If you go down the stone steps you will find a cellar with a wine bar, in a 900-year-old room from the Crusader period, with even more ancient artifacts from the Byzantine period — and with over 1,000 bottles of aging bottles of wine, all local to Israel. If you go up a different set of stairs, instead of down, you will discover the terrace, drenched in the panoramic scenery of the Mediterranean Sea and open during the summer — and during the winter months too, when the weather permits. Guests and outsiders are all invited to sit, drink a glass of wine, or more, and watch the swallows in flight (really). And if hunger sets in, you can add a Galilee cheese platter to go with your wine, 60 shekels for a small platter, 120 shekels for the large platter. If the cheese, or the wine, makes you even hungrier than you are tired, you can take comfort in the fact that the Uri Buri restaurant is just a three-minute tipsy walk from the terrace. And from 5:30 P.M. to 7:30 P.M. they celebrate happy hour here, and all the wine is 10 percent less. The sun terrace of the Efendi Boutique Hotel, Louis IX St., Acre. Located on the top floor of a 10-story office building overlooking the nation of Tel Aviv, Suramare opened three years ago. It’s a happy, lively culinary bar where you can eat and drink, see people and be seen. In keeping with Suramare’s slogan, “Drinks and Happy Food,” the offerings include mushroom pizza baked in a traditional taboun oven (47 shekels), or calamari and roasted potatoes, 52 shekels. They have a serious cocktail menu too, with eight colorful drinks. Suramare provides added value, on top of the bird’s-eye view of Tel Aviv, in the form of lectures and live performances held in the afternoon hours and on into the evening, twice a week. In July, the (kosher) culinary bar Esperanto opened for its third year. It is located on the roof of the Carlton Hotel in Tel Aviv, next to the Blue Sky restaurant (next on this list), and it is the summer location of Suramare (the previous entry). If Suramare’s motto is “Drinks & Happy Food,” at Esperanto it is “Drinks & Summer Bites.” Along these lines you will find a pleasing selection of hamsin-proof wines on the menu, such as whites and rose along with cocktails such as its “C of E,” based on the British Pimm’s, ginger ale and fresh fruits, 49 shekels. Suramare, 24 Saadia Gaon St., Tel Aviv. Esperanto, Carlton Tel Aviv Hotel, 14 Eliezer Peri St., Tel Aviv. On the 15th floor of the Carlton Hotel in Tel Aviv, looking out over the blue Mediterranean Sea — and the junk on many roofs — the Blue Sky kosher-dairy restaurant was opened by chef Meir Adoni four years ago. Its counterpart for carnivores, the kosher meat restaurant Lumina, on the hotel’s first floor, was established one year later. 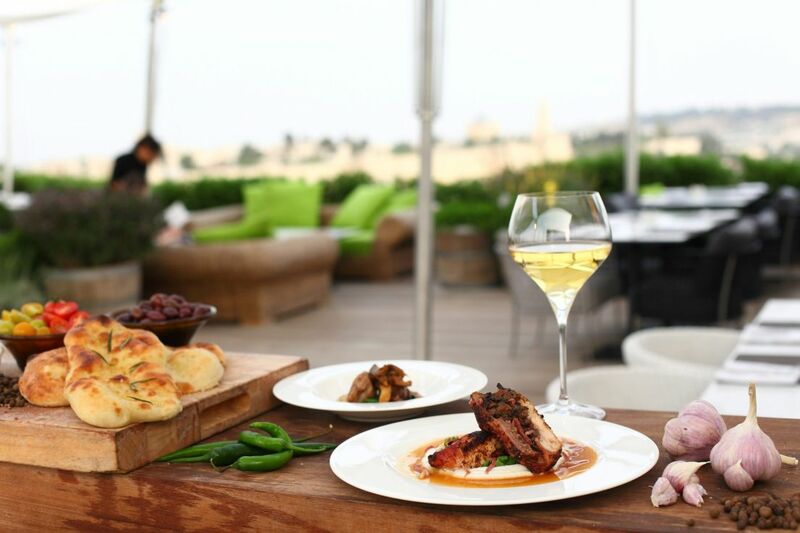 Blue Sky may be a kosher hotel restaurant in Tel Aviv, but the experience it offers is that of a seasonal gourmet restaurant, sometimes rich and other times exciting, with many dishes from land and sea — in keeping with the view — that go well with the wine and cocktail menu. Blue Sky, 15th Floor, Carlton Tel Aviv Hotel, 10 Eliezer Peri St., Tel Aviv. Right now, this is the hottest name, really hot, in the rooftop bar genre. It proves that with a bit of well-focused effort it’s possible to find quite a crowd that wants to look down on everyone else from above. Speakeasy, from the same of the Jimmy Who bar and lounge, four floors down, is situated in one of the most sought-after locations in Tel Aviv, at the corner of Rothschild Boulevard and Nahalat Binyamin Street. As a result it is crowded almost from the moment it opens until it closes, in the early hours of the morning. 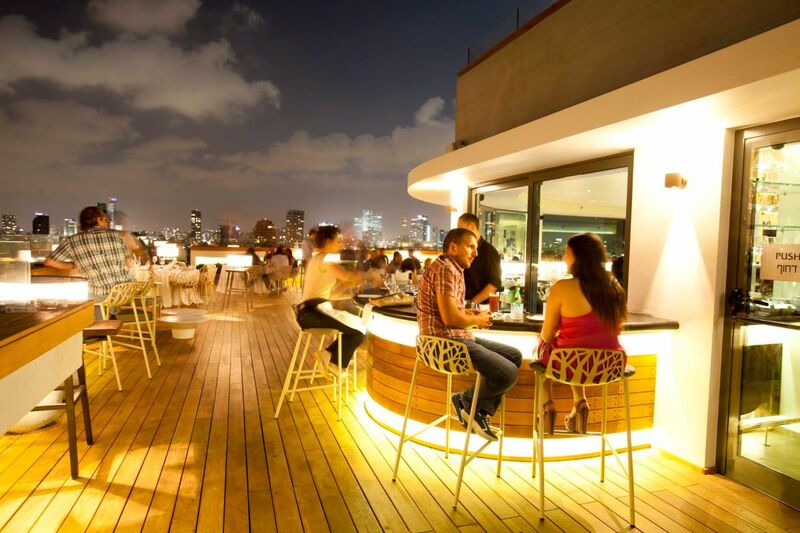 It certainly has everything you need in a rooftop bar in Tel Aviv during the blazing summer: It’s fun, a bit hedonistic and entertaining too, largely due to the great atmosphere. The menu has light grilled skewers, mini pizzas and tartars. You may not find the best food in Tel Aviv here, or the most exacting cocktails, but for now it’s the best place above sea level. Speakeasy, 24 Rothschild Blvd., Tel Aviv. On the Nahalat Binyamin pedestrian mall, in a building that looks as if it is about to collapse, you will find The Prince on the roof. An urban space for creativity and fun, the building is supposed to be a cultural center with food and alcoholic beverages — all on one rooftop. The Prince. Courtesy of The Prince. The atmosphere here is young, lively, kicking and mustachioed — and with a light breeze. In short, a hipster paradise. The cocktail and food menus change on a seasonal basis, as do the lectures and art exhibitions, when the place serves as a stage for young and more experienced artists. The food menu has its flagship dishes such as crispy eggplant fries, serving with smoked ketchup and green chili aioli. The Prince, 18 Nahalat Binyamin St., Tel Aviv. At the end of June, the seasonal summer bar of the luxurious Waldorf Astoria Hotel in Jerusalem reopened, for its second summer and through September. The location, one that is fitting for the prestigious atmosphere of this hotel, is open to those not staying at the hotel too. It offers an impressive menu of food and drinks. On the food side, the responsibility of the hotel’s executive chef Itzik Mizrahi Barak, are small to medium-sized portions — all purely tapas, with a Mediterranean variety, such as home-preserved bresaola from entrecote, served with country bread and Dijon mustard, for 50 shekels. On the alcohol menu are cocktails formulated according to the deepest and most precise secrets of mixology, based on the finest and most expensive brands of liquor, with the finest of aged and smoked ingredients. In the same place as all this splendor and glory, one can find a collection of cigars (did we say luxury?) available only at this hotel. The Garden Terrace, Waldorf Astoria Hotel, 26-28 Gershon Agron St., Jerusalem. 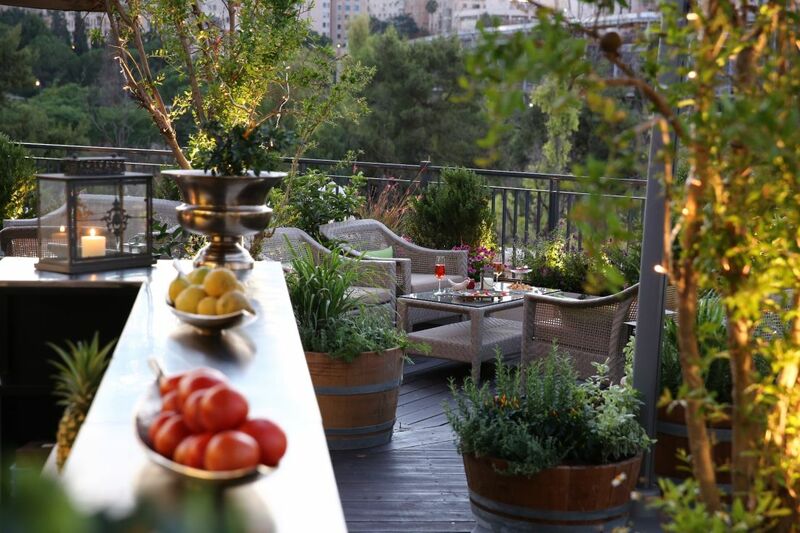 On the roof of the luxury Mamilla Hotel in Jerusalem is a find, RoofTop, and it is just what its name says it is. A large rooftop sun terrace with a brasserie-style restaurant that emphasizes the local cuisine, and takes it — intentionally — into the realm of haute cuisine. All of this facing the breathtaking view of the Old City of Jerusalem and its walls. Chef Cobi Bachar, formerly of the Mul Hayam restaurant, is in charge, and among the dishes you can find Turkish spinach and mushroom brik with a soft-boiled egg and truffle aioli, for 66 shekels. By the way, as long as the evenings remain pleasant in Jerusalem, you can mix your food with a cocktail and relax in your chair, or come just for an aperitif — and snack on a small something alongside your drink while watching the sunset. RoofTop, Mamilla Hotel, 11 King Solomon St., Jerusalem. 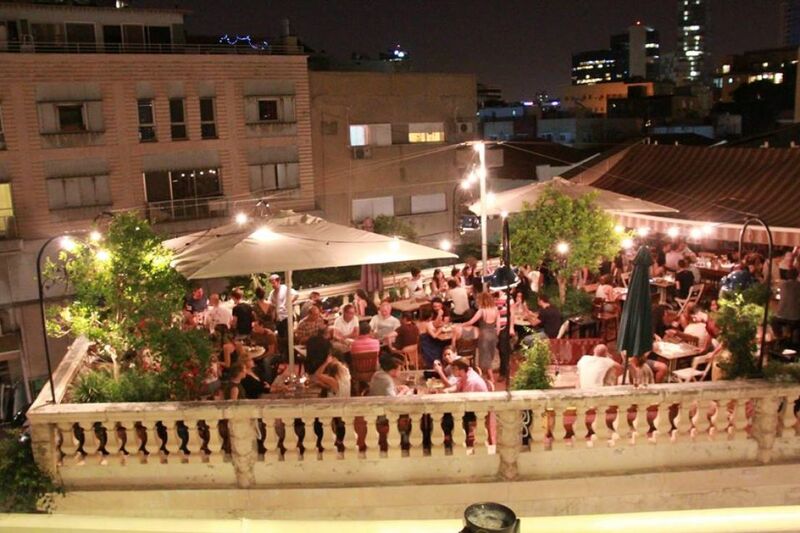 On the top floor of the Seraya compound, the old fortified Turkish government headquarters in the central square in the Tarshiha part of Ma’alot-Tarshiha, is Meaky’s Top View Bar, a restaurant and bar opened five years ago by Hatem Tanous. Since then it has made quite a name for itself, if not for the breeze and beautiful sunsets from the expansive terrace, then for its food. Among the dishes that have made Tarshiha, in the Western Galilee, a pilgrimage site are the home-smoked salmon served with baked potatoes, 75 shekels ($21), which are known far and wide, as is their aroma; along with other dishes from the large smoker in the restaurant, made from wine barrels. Or dishes from the grill, such as grilled pork chops served with roasted vegetables, 85 shekels.